Post notes and important messages on the Magnetic Dry Erase Board. Mount this board horizontally or vertically to suit your needs. 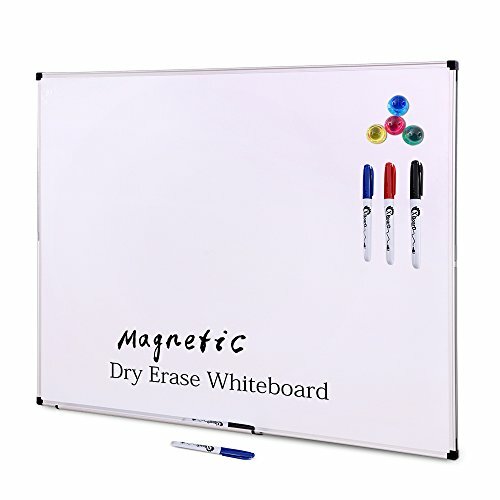 This dry erase board comes with attachable marker tray for easy access of the marker while writing. The frames of this erase board are made of aluminum that adds to its durability. The premium surface resists scratching and will last for many years. To add to your convenience, the magnetic dry erase board comes with mounting hardware. Recommend to mount in the spaces with light traffic. This white board comes with a clear, protective plastic film. Please remove the film before use by peeling it off starting from one of the corners. XBoard is a professional manufacturer of high quality board, produce hundreds of thousands of board products every month, from magnetic whiteboard, melamine whiteboard, blackboard, fabric board, cork board and Easel-Style Dry Erase Boards, etc. Each piece is rigorously tested for durability. Each piece is constructed with uniquely tough materials to reduce the risk of damage during shipping. Xboard keeps bringing best writing experience to customers all over the world! Complete with 3 dry erase markers and 4 push pin magnets. Everything You need to get started is included! View More In Dry Erase Boards. If you have any questions about this product by XBoard, contact us by completing and submitting the form below. If you are looking for a specif part number, please include it with your message.